Pete and Shelby commented that it would be hard to drag ourselves away to taste the local wines, NOT. Well imagine how hard it was to drag ourselves away from our camp on the Murray to head for home. We had had a great time at Corowa enjoying excellent food and wine on the banks of the Murray, I guess someone has to do it! But bad weather threatened and we had had enough rain this holiday so we decided to head for home. 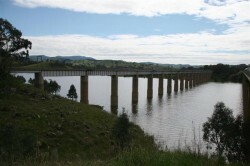 We travelled via Bonnie Doon to see Eildon with water under the bridge at Bonnie Doon, a great sight not seen for a long time. We also passed Lake Nillahcootie, which was as full as it could get. Pete, Barb and Adam will remember a stopover here on their way to Harrietville many years ago. Just as well there is no pub at Lake Nillahcootie to be missing a door! It was good to arrive home and find everything OK and to be welcomed back by our good neighbours, Janice and John. They have done such a great job watching over the place, including tending to fallen branches, mowing lawns, checking the letter box, etc, etc. It is so good to live in a fine neighbourhood full of friendly people. That’s all until the next trip. Just as well you left, I spent today driving from Shep back to Shep via kyabram yarrawonga Albury Wodonga And Wangaratta, 8 am to 8pm a huge loop, with maybe 20 minutes of it not raining, all the padocks were puddling up the roadside gutters were full and the roads were covered in huge puddles not a very nice day, so i’m glad you made it home dry. Till next trip, See ya.